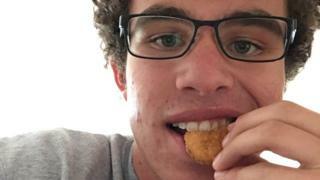 A tweet from a teenager asking a US fast food chain for a year's supply of chicken nuggets has become the most retweeted ever. Carter Wilkerson's plea broke Ellen DeGeneres' record when he passed 3,430,249 retweets on Tuesday. A spokesperson for Wendy's said: "We didn't expect Carter's response, and we couldn't anticipate the overwhelming support he has received." The company has donated $100,000 (£78,000) to charity in his name. On 5 April, the 16-year-old from Reno, Nevada, tweeted Wendy's asking how many retweets he would need to get a year's free supply of chicken nuggets. The fast food chain replied within a minute: "18 million." "Consider it done," Mr Wilkerson replied. He then posted a screenshot of the tweets with the call "HELP ME PLEASE. A MAN NEEDS HIS NUGGS." The tweet quickly went viral, reaching 1 million retweets in two days. It was shared by global companies including Apple Music, Microsoft, Amazon, Google and Twitter itself, and celebrities including Breaking Bad star Aaron Paul. Other companies replied to the teenager with their own offers, including United Airlines, which said it would fly him to a Wendy's restaurant in any of the cities it serves. "The [PR] industry has a word for this type of activity: 'brand-jacking'," PR Week deputy editor John Harrington told the BBC. "While not hugely original, it can be successful. It shows the importance of reacting quickly to trending topics on social media." And while Wendy's seemed as surprised as anyone by the response to Mr Wilkerson's tweet, Mr Harrington said that "from a PR point of view, they've played a blinder". "Most brands would probably have ignored the tweet or given a bland response, but by reacting with humour, Wendy's has created a vast amount of positive exposure and goodwill." The record for the most retweets was previously held by Ellen DeGeneres, for her 2014 Oscars selfie. The photo, which featured Bradley Cooper, Jennifer Lawrence, Kevin Spacey and Meryl Streep among others, had 2.1 million retweets by the end of the awards ceremony. When Mr Wilkerson first published his tweet, hers had about 3.2 million retweets. Ms DeGeneres brought up the challenge to her record on her talk show a week after Mr Wilkerson's initial plea, when his message had reached 2.6 million retweets. "Stop it right now," she joked. "I worked so hard to set that record… and this guy asked for nuggets?" "One moment the nation is reacting to a snap election, the next we are rallying behind a teenager who just really, really likes a chicken nugget," commented Twitter's UK managing director, Dara Nasr. Wendy's said that when Mr Wilkerson broke the record, it would donate $100,000 (£78,000) to charity. The money will go to the Dave Thomas Foundation for Adoption, a US charity set up in 1992 by the founder of Wendy's. The charity works to find permanent homes for children in foster care.